This blog post was written by Beverley Ho, a volunteer for Archives+. During the First World War, newspapers were a fundamental source of new, up to date information to the public otherwise had no access to. Therefore buying and reading the local newspapers was very popular and necessary. During this time, newspapers were printed in black and white tiny fonts despite being on very large sheets of paper. Both local and international events were reported, although international news was only found from time to time. Advertisements were commonly found in the newspapers. Often overlooked, advertisements expressed and mirrored much more information than just the advertised product or service itself. Reading deeper into the adverts, can help us understand the life style, living conditions and the general environment of the WWI period better. The type of products and service advertised, the way it were advertised such as the presentation, technique and their use of words can give us many hints and indications. Testimonials of satisfied users and the use of illustration were a popular shared technique. Advertisements were primarily of a small range of food or health remedies, occasionally cigarettes but seldom any luxuries or services. The types of food advertised mirrors what a typical diet consists of: bread, ham, bacon, margarine and some form of cereal such as maize flakes. Furthermore we can notice that food were measured in pounds (lbs) as opposed to grams (g) that is dominantly used today. Remarkably different to today, the money system were in pre-decimal currencies, which were pounds (£), shillings (/-) and pence (d). Looking at the adverts, we can observe the approximate costs of certain products and estimate their general cost of living. For example, from the Brito Margarine advert we can learn that margarine costs around 1/3 per lbs and in Lipton’s advert, maize flakes cost around 9½D per 3lbs. 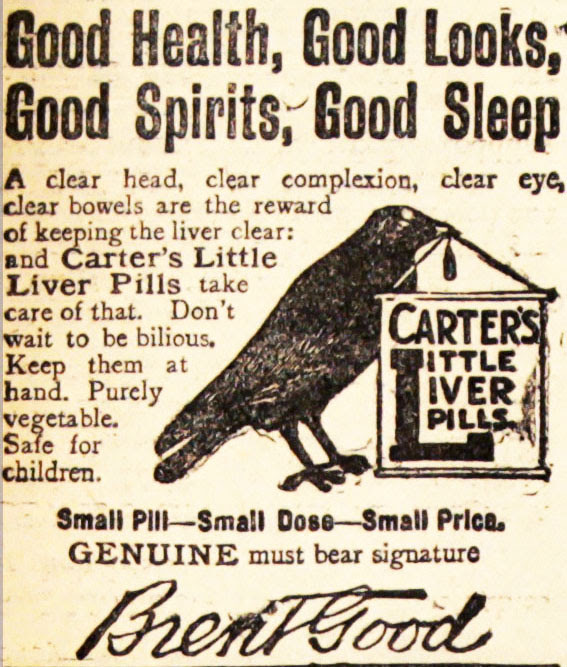 Health remedies found advertised include health salts, liver salts, liver pills, Phosferine tonics and tonic wines. These health remedies claim to cure a similar range of health problems, such as liver problems, anxiety, depression, insomnia, fatigue, indigestion and influenza; suggesting that these were the common illnesses during the WWI. Making a connection or relating their product some way to the war in advertisements seemed to be a popular marketing technique to attract users; such as having a soldier or war worker as a “satisfied user” to promote their product or stating their product is specifically for “war workers” or ideal for “war time”. These seem to suggest that working for the war were a popular and ideal job and being a soldier or war worker made you trustworthy and a good role-model. A particularly interesting example found in the Manchester Evening News is an advert for Phosferine. It reappeared in the newspapers numerous times using a range of members of the Army & Navy to promote their tonic medicine. The first promoting user was a “war-battered soldier” from the “5th Royal Berks, British Expeditionary Force”, the second user was from the “Women’s Auxiliary Corps”, and the third user was from the “Gun’s Crew” of “The Grand Fleet” (the main fleet of the British Royal Navy during WWI). In the advert, Phosferine claimed to be a “proven remedy” for a long list of health issues such as nervous debility, influenza, indigestion, sleeplessness, mental exhaustion, backache and headache. 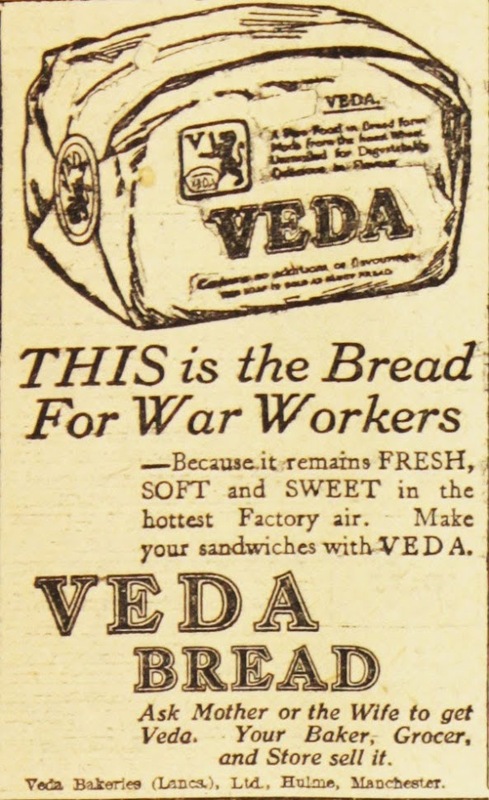 Another example is VEDA, a brand of bread, advertised specifically “For War Workers… remains FRESH, SOFT and SWEET… Ask Mother or Wife to get Veda.” In this advert we can also learn that bread were sweet and that woman typically carried out the food shopping for the family. There are safety regulations and clinical trials on most goods sold today such as food, medicines and healthcare products, however there were no such system to rely on during WWI. Therefore precedent to the product and advertisement regulations, the health & safety and effectiveness of those products could possibly be questionable. 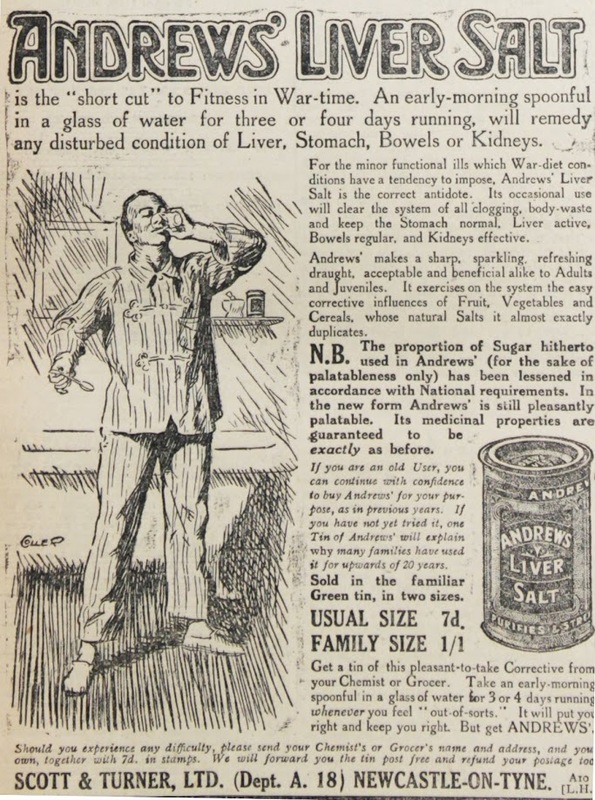 Impressively Andrews Liver Salt is still sold today which may prove its safety and effectiveness, although the packaging has undoubtedly changed. 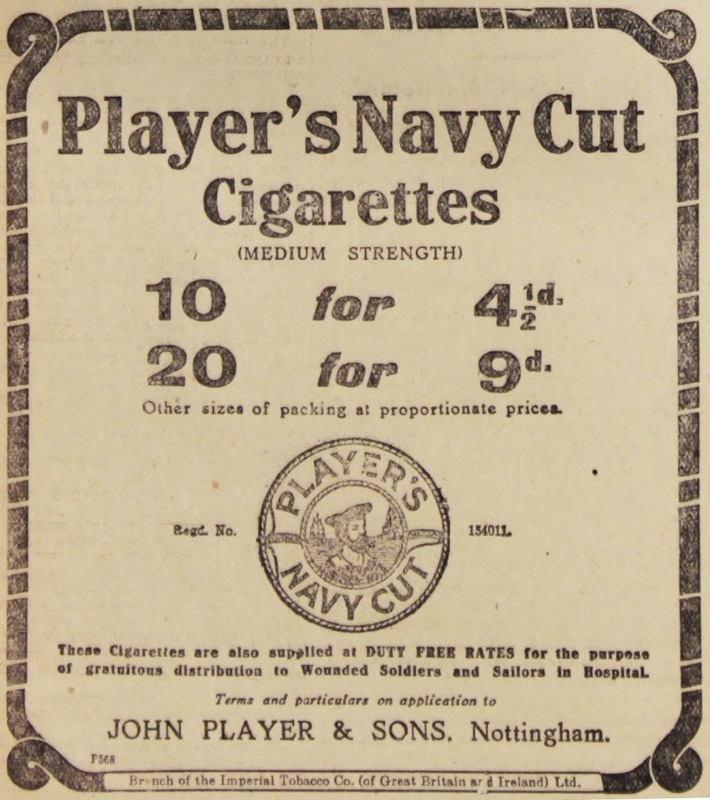 Ultimately exploring these advertisements from 1917’s Manchester Evening News has gave me a further insight into the life style, living conditions and environment of the WWI period. Overall life wss very difficult and different to now, there were no health & safety regulations, people could not afford luxuries, they were overworked due to long hours, had hurried meals, a diet lacking in nutrition, had to rely on health remedies and constantly lived in worry and anxiety.